The U.S. is facing a crisis with the quality, disparity and cost of our health care services. We operate a fragmented health care delivery system marked by silos of data. Creating a cohesive health care system is exactly what we need in order to deliver high-quality, cost-effective, and timely patient care. Luckily, we have a model to follow directly to our north in Canada. Canada’s 14 federal, provincial and territorial deputy ministers of health - as well as regional health care authorities, other health care organizations and its information technology vendors and suppliers – are working together toward a common goal: to provide 50 percent of Canadians access to a secure electronic health record by 2010. How does a country with more than 33 million people come to an agreement and move forward with a country-wide health care IT system? 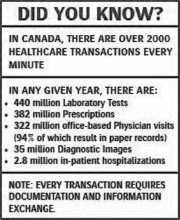 Easy – in Canada, the health care IT infrastructure functions like a business unit. To move forward with EHR adoption, this group did research, made a decision, secured funding, and began implementation. In the U.S. we don’t make decisions nearly this quickly. We’ve been churning over patient identification, for example, for more than a decade. Churn costs money; churn costs development time and effectiveness; ultimately, churn costs lives. Let’s take a lesson from our northern neighbors and get the job done. Spearheading Canada’s initiative is Canada Health Infoway, Inc., an independent not-for-profit organization that invests with public partners across Canada to implement and reuse compatible health information systems. -- Client registry systems, similar to enterprise master person indexes and record locator services that support health information exchanges in U.S. domain repositories. In this model, each infostructure interoperates with others in a peer-to-peer manner through the Health Information Access Layer (HIAL), where the data-sharing journey begins and ends. Let’s learn from Canada’s success and follow a business-model approach. First, of course, let’s have a blueprint. Second, let’s invest wisely and strategically – and measure results to monitor that investment. The Canadian government invested $1.6 billion in its initiative. The government entities knew they needed to see value from their investment, so they funded a small number of targeted areas rather than spreading their investment across a range of initiatives. 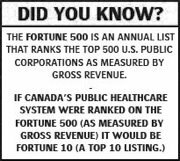 The Canadian government also demands results. Each year, Infoway is accountable for reporting status and success metrics. Again, this mirrors the way a business unit would operate. Third, no churning. Period. Let’s make decisions and start to move. Standardizing business processes in any industry requires a three-level “sell," he says: to the executive decision makers, to the people with industry domain expertise, and to the people that build the business processes. “Only if everybody in this ‘stack’ knows the other groups are good-to-go, can you have success,” he says. I love Canada. I just don’t want to move there. In fact, I’d like to retire in Montana. My hope is that we’ve got a nationwide health care IT system in place by that time. Needless to say, the clock is ticking. Can’t we follow someone else’s lead? Original Article By Lorraine Fernandes. Fernandes is a vice president and health care industry ambassador for Initiate Systems, Inc.